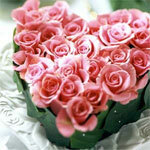 On 14th February, we will be - if we are one of the lucky ones - celebrating Valentine's Day. But do you know its origins? In the III century AD, Valentine was probably a priest in Rome. The Emperor Claudius II had cancelled all marriages, as men with a family were less keen to go to war. Young lovers went secretly to see Valentine to receive his blessing. He was subsequently imprisoned and decapitated. Before his death, he offered the blind woman he loved - she might have been his jailor's daughter - a bunch of leaves in the shape of a heart and a letter saying 'From your Valentine'. She was miraculously cured from blindness and he became a martyr. 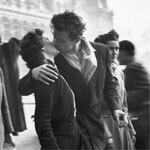 Doisneau's "Kiss by the Hotel de Ville"
The festival date goes back to the Lupercalia festival (from the latin Lupus and Lupercus, god of fecundity, shepherds and herds). It was a pagan celebration on 15th February. During these celebrations, young men would take part in a draw with the names of the young women in an urn. The couple would spend the time together at the banquet (some say during a whole year), often ending in the couple getting married. The Lupercalia were abolished when Rome became Christian. The Church, finding these festivities barbaric, encouraged Valentine's Day and Saint Valentine became the couples' protector. During the Middle Ages, a young woman chose a man to court her and in turn he was supposed to offer her a gift. In France and England, February 14th was also believe to mark the beginning of birds' mating season, adding to the idea that Valentine's Day should be a day for romance.